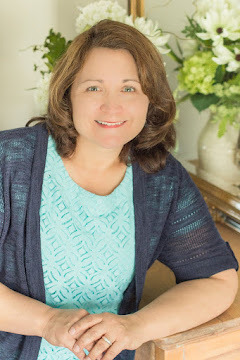 We won't be able to save everything, but here are a few ideas I've gathered to help keep our food storage items safe. The changes are simple, logical and inexpensive. You've just set up your food storage room, but did you think to make it earthquake safe? Let me say immediately that my room is not finished, but I have done some research to help me know what I should change. And I know what earthquakes feel like and I don't want my food ruined after all the work and money I've spent to gather it. 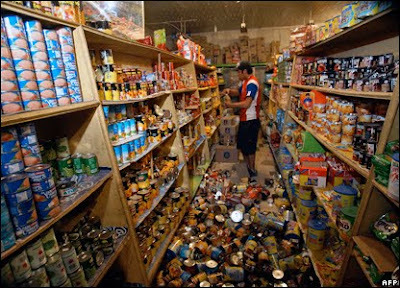 But first, watch this soundless video that was taken with surveylance cameras in a grocery store during the 7.0 earthquake in Haiti. Could this happen to your food storage room? There are many types of shelves, but whatever you end up with should be braced to a wall stud, floor, or other shelves. If you have cinder block walls, you can find the right bolts at a hardware store, but be careful not to crack the cinder block. Get some L-brackets and screws to attach your shelves. If you don't attach the shelves, the entire shelf unit could fall over in an earthquake and block entry to your room as well as damage your items. 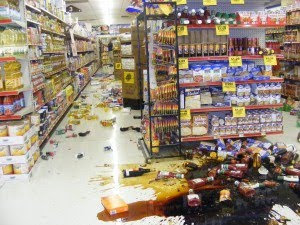 During an earthquake, cans and bottles will fall off shelves. 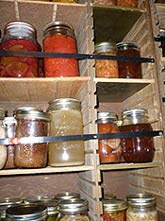 I always cringe when I see pictures of peach jars perched atop food storage shelves; peaches that took hours to make, but will take seconds to break. Here are some ideas on how to secure you cans and bottles from Frugal Fraline. a. Drill a hole through sides of shelving and thread webbing, wire, rope through holes and secure. b. Attach clips to plasticized wire and clip to eye bolts. c. Dowels can be attached to wooden shelves. d. Hook bungee cords to eye bolts. e. Install baby locks on cabinets. f. Line shelves with rubberized no slip liner. Another idea is to attach strips of wood to the front of wood shelves. If you stack boxes of items or mason jars, make sure they are held in place with bungee cords or cording. Try not to stack plastic 5 gallon buckets more than 3 high as the weight can ruin the seal. And the tower that topples will not be a pleasant experience as well. If you have food items behind cabinet doors, attach child safety latches to the cupboard doors. I know few people who like putting latches on their cabinet doors, but have you ever ridden in a motorhome and had something fall on your head from an overhead cabinet? It doesn't feel very nice. I want to add latches to my highest kitchen cupboards where lots of glass is stored. Great things to think about. Earthquake is our most likely natural disaster, so it would be wise to make this a priority. There are several things I would like to add. One is is that something to keep cans and jars from falling off a shelf is very important. However, in regards to jars, even if you keep them on a shelf, the up and down motion an earthquake can cause could still break glass bottles. If you "can" (or rather "bottle") your food, then considering some way of protecting bottles, even on a shelf with other restraints to keep the jar on the shelf, could well save your food storage so that you have something to eat. (I might add, living where there could be 'shelling' - such as in war, such as we see happening in Syria, by the government of the nation, could also affect whether or not jars and bottles would survive on a shelf, without breaking. I propose one of three solutions to this. The first one is the least expensive, and the easiest, but could still have problems. And that is to store the bottles in the box they may have been purchased in, which will have single width dividers. The closed box might keep the filled jars from moving around much. But, especially if the box is old, it may not do this (so well). Also, the single width cardboard dividers hardly offer any cushion between bottles. Solution #2 would be to fashion cardboard sleeves with sides bottom & even tops (jars can break if they are suddenly slammed on a shelf above, as well as they can on a shelf beneath. So, it is not just a matter of keeping bottles or jars from colliding into each other, but to also keep them from hitting the shelf they are on, as well as any shelf above them, with something to cushion them. Generally speaking, the thicker the cardboard, or more layers (like two layers instead of one) should help protect them more & better. Of course, this consumes more room to store things. They would need a tucked in lid on top so you can open the box to retrieve the jar and its contents, to use. Solution #3 - Probably most expensive, but probably the best solution. Getting and/or fabricating BUBBLE-PAK sleeves (with bottoms & tops) from any of a number of different sizes of bubble pak would probably protest a jar or bottle best. Again, you would want bubble-pak on bottom and top of the jars or bottles to help keep them from getting broken if they were tossed up and down. Perhaps one could put a cushioning material on both the top of one shelf and on the bottom of a shelf that is above bottles or jars, so hat a mere bubble-pack (or cardboard) sleeve would be all that would be needed otherwise. Keeping the amount of area ABOVE a jar (whether using an all encasing cardboard or bubble-pak 'cocoon') would be best to keep how high a bottle or jar could 'bounce' in the case of an earthquake (or bombing or shelling). This also might help keep a shelf from breaking (the higher cans or bottles or jars filled could fly upward, would affect the weight and force when they come downward, too). Using sleeves or "6-sided" (front, back, both 'sides', top, & bottom) 'cocoons' of either bubble-pak or cardboard can cause an issue with knowing what is in it (&/or in the bottle or jar it contains), withOUT removing the 'cocoon' or 'sleeve'. So, whether provided a small 'window' (as I can mostly only imagine being possible on an otherwise thick cardboard container) might be the only way, other than having some exterior marking (whether by marker, label, can, or shelf label at the place on a shelf they are stored) are the only solutions to this potential drawback I can think of. Wow, David. I think you should invent something and sell it to all of us. I agree, boxes are probably best. Every time I see a bunch of canning jars on a shelf, I cringe. I use old socks to put my jars in to cushion them.. Cut off the foot part of an old tube sock and your ready to slip over the jar. I use the boxes, and the jars are on the bottom shelf and the floor under that shelf. I'm now thinking of slipping regular cardboard in between the boxed jars, rather than the stock single layer. Thanks for the information. @David: Those are good ideas, and a great reminder to think about jar-on-jar forces. I feel that I personally would not like (and maybe just out of silly aesthetic reasons) having so much wrapping around individual items. It's partly an inventory-taking problems for me; I like to see more or less at a glance what I have on the shelf, and I don't always put descriptions/titles on all my mason jars (though of course I always date them). 1. Line shelves (bottom, sides, back, and front retainer) with low-pile carpet scraps, felt, thick rubber shelf liners, etc. This will not protect as much jar-against-jar, but will help reduce some vibration. 3. Maybe I just am trying to avoid bubble wrap. I like the sock idea two comments above. Another good choice might be the rubber mesh-type shelf liner. It's thin and quiet, but still offers a decent amount of protection. Thanks for making me think about protecting individual jars!